NEW DELHI: Vishwa Hindu Parishad leader Ashok Singhal passed away on Tuesday, less than a week after he was admitted to private hospital Medanta in Gurgaon following complaints of breathlessness. The death of the 89-year-old Hindutva veteran was announced by Singhal's deputy in the VHP - Praveen Togadia. He was on life support system since Saturday evening. 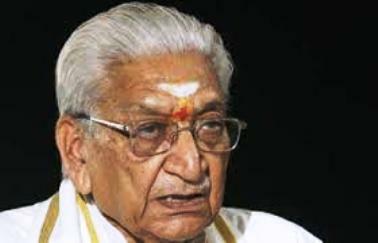 "89-year-old Ashok Singhal, was admitted at Medanta in Gurgav on October 14 in critical condition. He passed away at 2.30pm today. He had multi-organ dysfunction, ARDS and sepsis and was being treated by a team of specialists," said Dr AK Dubey, Medical Supritendent at Medanta. Singhal has been suffering from respiratory and heart problems for the last one month. On October 20, Singhal was admitted to the hospital after he complained of chest pain in Allahabad. He was immediately flown to the city in an air ambulance. He was discharged on Thursday after he showed signs of improvement. He was again admitted late on Friday night. Singhal was at the forefront of the Ram Temple movement, which seeks to build a temple at the same site in Uttar Pradesh's Ayodhya where a medieval mosque, Babri Masjid, once stood. The mosque, which many believe was built on the birthplace of Lord Ram, was demolished by a Hindu mob in 1992.